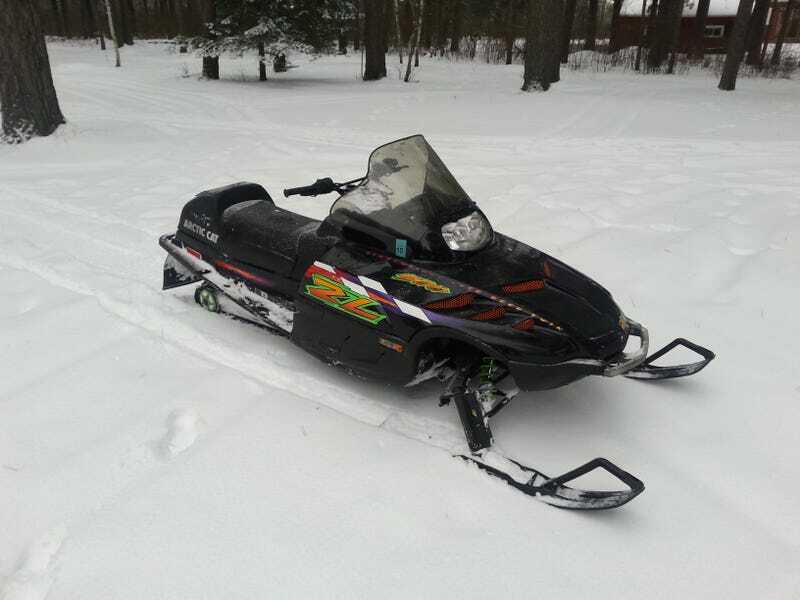 My not-at-all pristine 1998 Arctic Cat ZL500 from last year. So it is nearly winter time in the ol’ northern MN. So that means snowmobile prep time before I have to get it ready in a freezing cold garage. Last year I rebuilt the engine since a cylinder had a nick in the nikasil coating. So now my sled runs like a top, for the first time ever in my 4 years of ownership. I should preface this next part by saying this is my 3rd ZR2 chassis sled I’ve owned, seems like I had more money in high school then I do now. So unfortunately, having it running well showed me other deficiencies in both its handling characteristics and its comfort. Since I am a complete cheapskate and can’t afford a new fangled snowmobile, I had to decide how to fix these issues. First problem, the old busted foam seat that had no support. I could either, roll the dice on a used seat, buy a $300 Boss seat, or modify a newer seat to fit. I chose the latter. So perusing ebay one sunny summer day I found a nice 2007 Arctic Cat Crossfire seat for $80 shipped. Needless to say, seat acquired. Now I have begun the process of melding the seat to the old fuel tank, because Arctic Cat didn’t think to make them backwards compatible. I started by removing the old seat and comparing the old seat/fuel tank base to the new seat. On new sleds the fuel tank and seat are separate. My old seat was stapled directly to the tank base. Then I decided I would have to cut up the new seat. First I removed a bunch of upholstery staples so I could remove the foam to see what fitment issues I had to overcome with just the bare plastic frame. So this is as far as I got yesterday, anyone have any ideas? My plans so far are to cut and screw or rivet the plastic to fit as close as possible then cut the foam to fit and to re-staple the vinyl back on. After that is accomplished I will have a taller, narrower, much firmer seat. As you can see my biggest issue is fitting around the old tank smoothly. To address the suspension issues I decided to go with updated new rear suspension springs. These are the load bearing part of the suspension that does most of the work holding you up while you ride along the trail. The shocks come more into play as you hit bumps or jumps. So using the AC suspension spring chart I found online, I chose springs that had similar geometry but thicker spring material. These springs are called Fat-boy springs since the ones originally on the ZL were rated for riders between 125-175 lbs. I being 6' 2" and weighing in at 195 lbs decided a firmer ride would be much better. So far my progress has been slow since I’ve been taking care of my sick 11 month old this week, but I have everything apart and now need to order new springs and idler bushings. My sled as it sits now. I can’t decide if its a low rider or stanced. Those of you that may say that I need to have new shocks or rebuild my shocks on the rear skid, I had that done last year so I know they are in good shape. Other fixes I hope to have done before it snows. I will do a steering relocate to raise my handlebars up higher and I will have to come up with a brake light solution. My bonus round will be removing all the old scratched stickers and repainting the hood orange or green or maybe just black again. Anyone have an suggestions or ideas for me. And if anyone is up by the MN Iron Range or North Shore this winter for a trip, drop me a line and I’ll try and meet up for a ride. * Yes I know it would be easier to get a newer sled, but I’m stubborn, cheap and I hope to have all the issues sorted out so I can give this to my nephew in a few winters so he can enjoy it, or just make my brother fix it a bunch since he told me it was a “good” sled and that I should buy it 4 years ago from one of his buddies.